IMAGINE being able to track the evolution of the universe, back to almost the beginning of space and time. 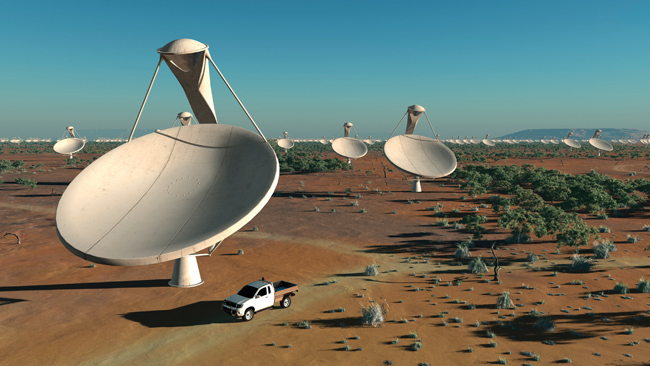 Enter the Square Kilometre Array or "SKA", the largest proposed telescope on Earth. Soon to be - hopefully - located in the Australian outback. Much like a palaeontologist digging down through the layers of earth, studying fossils and materials to determine the history of life on earth, the SKA will study the layers of gases and materials to determine how the universe came to be. When it's built, the SKA will be 50 times larger than the world’s current largest radio telescope and comprise of over 3000 antennas or dishes scattered over a continent or more. In total, it will span up 5500km. Half of those dishes will be in a central 5km by 5km region. All the information from these will be brought together by the world’s fastest broadband network running at 100 terabytes per second - 10 times the equivalent of the world’s internet traffic today. All that data will be brought to this central point, the world’s fastest super computer. It will run at one million million million operations per second or one ‘exabyte’. The numbers might sound a bit unbelievable, but Dr Brian Boyle, CSIRO's SKA Director for Australia and New Zealand, told news.com.au it's an indication of the sheer size and quality of the information the SKA telescope will bring in. “In more modern day terms, the total amount of current digital information is around 26 exabytes generated every year digitally in the world," he said. The decision on who gets the SKA is coming to a critical crossroads. The 20 countries actively taking part in the SKA project are hoping to form a legal governance body by the middle of 2011. Then they'll decide whether to place it in either Western Australia or southern Africa. That decision will be made in 2012. Radio quietness, for starters – it would be best to go somewhere without almost no radio interference. “Australia has a large natural reserve of radio quietness because of such a low population density," Dr Boyle said. We also need space, one aspect Australia certainly doesn't lack. And with the inclusion of New Zealand, the area available increases by almost 40%, making the information collected even clearer. “Australia (also) has the infrastructure, we have a broadband research network that minimises the ‘last mile problem’ of getting the network to all these remote sites,” Dr Boyle said. Scientists, engineers, astronomers and cosmologists from all participating countries, including Australia, will not only help with the telescope’s development, but also its use. “Australia I believe has the best scientific case to have the SKA sited in it, " Dr Boyle said, "but ultimately this is a global project." So how far could the telescope see? How about the ability to look back to the beginning of time? “The SKA will be the first radio telescope that will allow us to go back to that very first few hundred thousand years after the Big Bang and trace this history of gas, the gas from which the stars came throughout cosmic time,” Dr Boyle said. Much of the technology that the SKA will use has yet to be invented, Dr Boyle said. "The SKA is pushing the very boundaries of what is possible in the information technology area. “It sounds strange but there is the classic example from back in the 1970s at CSIRO, a radio engineer was looking for black holes. “He didn’t find but eventually his formulas and research went on to make Wi-Fi technology you’ll find in your laptop or mobile phone, so a lot of that technology came from radio astronomy. “So it there another Wi-Fi in the SKA bank? I think you can bet on it. I respectfully voluteer my services to the project; To whomever is the Principle,in this expedition:My skillset is in transport,and equipment operations,fields. It would also be a great way to satisfy my desire to visit this unique corner of the globe,and earn a living while doing it! E-mail me @ marcusrockks@yahoo.com,if this can be facilitated. I cannot be more serious,and frank,about this.I'll need to secure passport,and satisfy guest worker rules,which I am more than willing to meet! Thank you,in advance.I look forward to any sincere replies. Good Day!